I was asked via Patreon to look at the Tales RPG series, which I have very little experience with. Given time constraints, I decided to focus my energy on an anime version, knowing full well that such adaptations often do not fully capture what makes the source material appealing. With that in mind, I chose to go in blind on the earliest Tales anime: Tales of Eternia. My immediate feeling from the first couple of episodes was that the core cast is a fun and likable bunch, and that they stood out above all else. My favorite is Farah Oersted, the martial arts tomboy with an oddly familiar an appropriate voice—turns out she shares a voice with Videl from the Dragon Ball franchise. The show at times felt beholden to its RPG origins, especially during fight scenes, which is not helped by the roughness of the early-2000s digital animation. But as I kept watching, I wondered just how much ground they were covering from the original Tales of Eternia. Halfway in, it seemed more like they were on their very first missions, when you’re still kind of learning the ropes. By the time a major plot twist comes in, it feels strangely paced—like either the story was moving too slow for something like this, or it had been skipping over too much. At this point, I decided to look at just how this anime maps onto the game. The answer is that it doesn’t—at least not exactly. 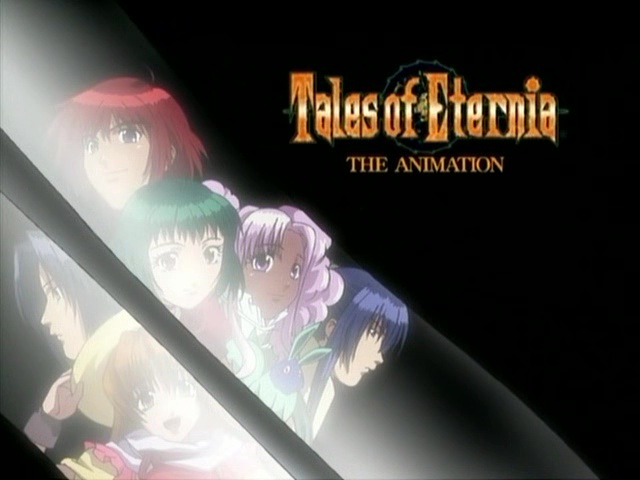 The central characters are more or less the same, except drawn in an early-2000s anime style as opposed to the softer designs of the game (or its squat sprites), but the story of the Tales of Eternia anime does not take place anywhere in the actual RPG. Suddenly, it made sense, and the feeling I was getting from the anime version was all too familiar: the Tales of Eternia anime is basically a filler arc. The challenge of adapting an RPG is tricky because there’s not necessarily enough time to cover everything, so I can see why they took this approach. Shoving the game’s story into 13 episodes probably wouldn’t have done it justice, so going for a wholly original story is an interesting solution. However, the reason it feels so much like filler is because it straddles the line a little too much. The anime tries not to touch the main story so there are no real stakes, but it also seems to assume that this somewhere into it, so the anime isn’t terribly free to take liberties. All that remains is the charm of the characters.